Today you will Learn about culinary arts degree programs, including what degrees and classes are offered, and get the skinny on careers open to culinary arts graduates. Whether it’s brunch at the Standard in Los Angeles, afternoon tea at the Plaza in New York or a late night steak at the Pump Room in Chicago’s Public Hotel, the top hotels in the country– and around the world – offer great dining experiences to their guests, at restaurants that become destinations in their own right. Creating the right restaurant for a top flight hotel – or for a local inn – requires understanding local food, consumer preferences and flavor profiles. So it makes sense that a culinary arts degree can be useful for hotel chefs and managers. Culinary arts programs can be found at all sorts of schools, including community colleges and trade schools, as well as two-year and four-year colleges and universities. Some cooking schools and culinary institutes are devoted exclusively to culinary arts training. Degrees range from certificates to associate and bachelor’s degrees, and culinary arts training is also a component of some advanced degree programs. Hands-on training is a crucial component of a culinary arts program, and the hands-on nature of the training also means that a school is not the only place to become a chef or accomplished culinary professional. Some people begin their careers by working in the industry, receiving on-the-job training through apprenticeships with working chefs. However, there are a number of advantages for attending a formal culinary arts program. These programs not only teach students how to make a soufflé, but many take a more holistic approach to the profession, and include courses in management, restaurant operations, nutrition, sanitation and other subjects that can make graduates more competitive for jobs in the hospitality industry. Some culinary programs have even collaborations with hospitality management programs, which provide a comprehensive education in cooking skills as well as the operations of complex hospitality organizations. Artisan bread. Sauces, soups and stocks. Chiles in the global kitchen. Bounty of the sea. These are just four courses offered by one culinary arts program. Classes are often held in kitchen facilities, and class sizes are usually small, helping students receive individual attention, which is important when the subject being taught involves razor-sharp knives and open flames. While certificate or diploma programs might focus on one set of skills or type of cuisine, associate or bachelor’s programs likely include some courses that cover more than the best way to butterfly a shrimp or plate a dessert. Restaurant and event management, business courses, and even science classes or classes on applicable laws may be part of a standard culinary arts curriculum at the associate or bachelor’s level. Externships are also common for culinary arts students and may involve working a certain number of hours each week in a hotel or restaurant setting. In some cases, a student rotates through different positions, learning how to do everything from line cook to host to sommelier. 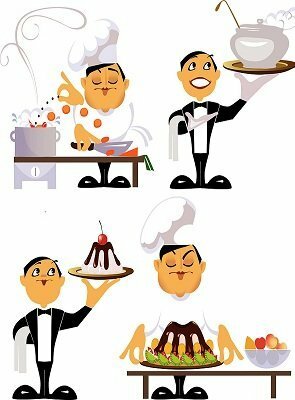 Students may also specialize in particular branches of the culinary arts, such as pastry chef. The median hourly wage for cooks was $9.88 in May 2012. The median wage is the wage at which half the workers in an occupation earned more than that amount and half earned less. The lowest 10 percent earned less than $8.00 per hour, and the top 10 percent earned more than $14.68 per hour. The median annual wage for bakers was $23,140 in May 2012. The median wage is the wage at which half the workers in an occupation earned more than that amount and half earned less. The lowest 10 percent earned less than $17,200, and the top 10 percent earned more than $36,980. A culinary arts degree can open the door to diverse employment opportunities in the hospitality industry. Finding the right program could help you be the name behind the next “it” destination.